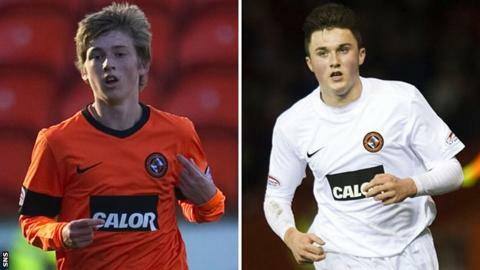 Dundee United youngsters Ryan Gauld and John Souttar have signed new contracts tying them to the Tannadice club until January 2016. Both players, who have featured in the first team this season, have come through the club's youth system. Midfielder Gauld, 17, and 16-year-old defender Souttar have also been capped by Scotland's age grade sides. "We are delighted that both these young stars have signed up for three years," said chairman Stephen Thompson. "This rewards the efforts of everyone involved within our youth academy." Gauld made his debut late last season while Souttar became United's youngest ever first-team player when he started against Aberdeen on 2 January. "Ryan and John are the future of Dundee United," added Thompson. "They are two of the most exciting talents in the Scottish game and, as a club, we must continue to produce this level of talent."